Officials in Houston work hard to provide tournament-level officiating for the local and visiting skaters. Officials maintain their fitness and skating skills by working out with Houston Roller Derby. 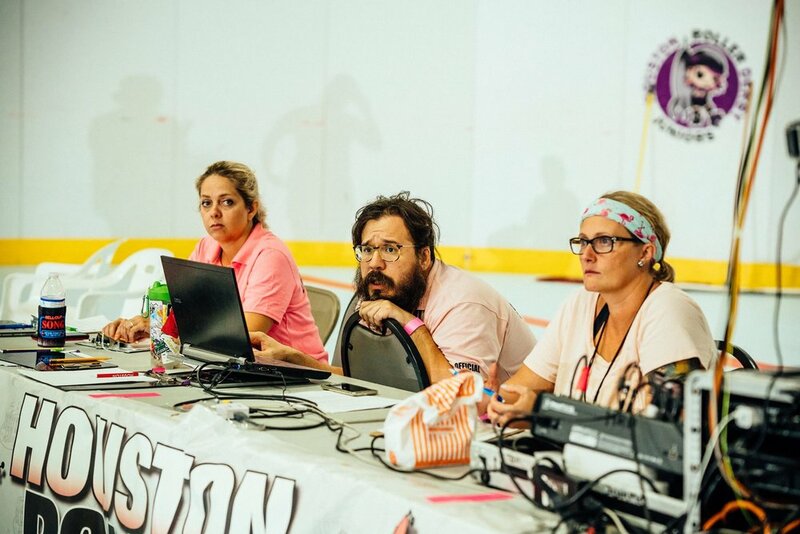 The officials in Houston work hard to stay on top of the latest rules and procedures by liaising with the WFTDA and by participating in as a many tournaments and multi-bout weekends as they can. Being a WFTDA official is not a just a job, it is a privilege. First, THANKS for being interested in volunteering! HRD thrives on high-energy fans of the sport who love it so much they are willing to pitch in a help it succeed in Houston. Secondly, if this information seems daunting to you, it is! And by design. Being an official is hard work and not a decision to be made lightly. Please take the time to read about our standards. The standards for Houston Roller Derby Officials are the same standard as the WFTDA certified official. Everything about being a Houston Roller Derby official flows from that. Before you consider contacting Houston Roller Derby about officiating, please visit www.wftda.com/officiating and learn as much as you can about the sport, officiating WFTDA flat track derby, and what it takes to be a certified WFTDA official. WFTDA bouts require two kinds of officials, those on skates (Skating Officials) and those off skates (Non-Skating Officials). Both kinds require commitment, rules knowledge and the proper mindset. Officials work out with the league and are expected to be available on Mondays and Wednesdays at the Houston Premier Sportsplex (HPS) facility for regular league practice. The best training environment for officials, skating or non-skating, are scrimmages. Attendance at these practices is key and will determine your opportunities to officiate games. At the heart of officiating roller derby is an appreciation for the opportunity provided by the organization. That opportunity is to take part in a growing sport at the highest levels of competition. A roller derby bout is not a show. It is not a stage to show off. You are supporting a sport at its highest levels and the sport depends on you to strive to be the best and most professional official you can be. Houston Roller Derby is not interested in taking on, training, and providing opportunities to people who do not aspire to officiating WFTDA roller derby at its highest level. WFTDA roller derby is a complex sport. It is dynamic and full contact. Your 100% knowledge of the rules is a cardinal aspect being a derby official. The sport depends on your professional approach to knowing the game, the rules, and standard practices as per the highest competition in the WFTDA. Derby is a fast-paced, full contact sport. You have to be physically and mentally sharp and bring all your professionalism to bear. In short, officiating derby is serious business. It is not a carnival, dating pool, reality show, or ego pond. It is a sport that needs dedicated, reliable, and professional officials. Having the right mindset or attitude is a huge part of what makes a successful roller derby official—or any sports official. A good official is very clear about the right reasons to spend all the time training and preparing. The sport is paramount and the best officiated events are the ones where no one really notices the officials or the officiating. As an official, you need to be trainable, humble, and mature. Nothing short of that is acceptable. Houston Roller Derby Skating Officials are expected to be able to approach the skating standards of a WFTDA certified official. Please download the requirements linked below. If you do not feel comfortable performing any of these actions, please do attend Tuesday Rec league where you can attend Level 1 training sessions to improve your skating skills. Also, skate as much as you can, at skate rinks and on the street. Non-Skating positions are available while you are ramping up your skating skills. In fact, your willingness to volunteer as a non-skating official will enhance your demonstration of commitment as well as give you great experience. So if you are gung-ho to be a skating official for HRD but are not confident in your skating yet, don’t hesitate to inquire about non-skating officiating. To get started, contact Houston Roller Derby and make an appointment with a representative from the officiating crew contact us! You will be asked to meet with the head referee or a designate. If you are interested in being a skating official, you must be prepared to skate with proper gear and ready to demonstrate your skating abilities. You must be prepared to undergo a short interview where your knowledge of the sport and the rules will be tested. Applicants will be tried on a case-by-case basis. You will receive an email within the week inviting you to attend practice as a probationary official or to spend another month working on your skating skills or rules knowledge, after which you may contact HRD for another appointment. If you made it this far, you may have what it takes to officiate WFTDA Roller Derby. Thanks again for your time and interest in volunteering! Even if you feel like officiating is too much, HRD can always help you help us, see our volunteer page and check the calendar for opportunities!